My first real trip (and last) to Mexico was in 2006. After celebrating the wedding of good friends in Ireland, my husband and I flew home and stayed just long enough, about 36 hours, to unpack, do the laundry, pack again and take off for warmer weather. We reconnected with our just-married friends south of the border and spent two weeks becoming acquainted with a small part of the Yucatan peninsula from south of Cancun to Tulum. We were entranced by the warm, turquoise waters of the Riviera Maya and promised to return but time has not permitted a follow-up visit. So when we received an invitation to join friends on a last-minute trip to Mexico, we jumped at the chance. Within 48 hours we had two seats booked on a flight, we secured a hotel room and were on our way. 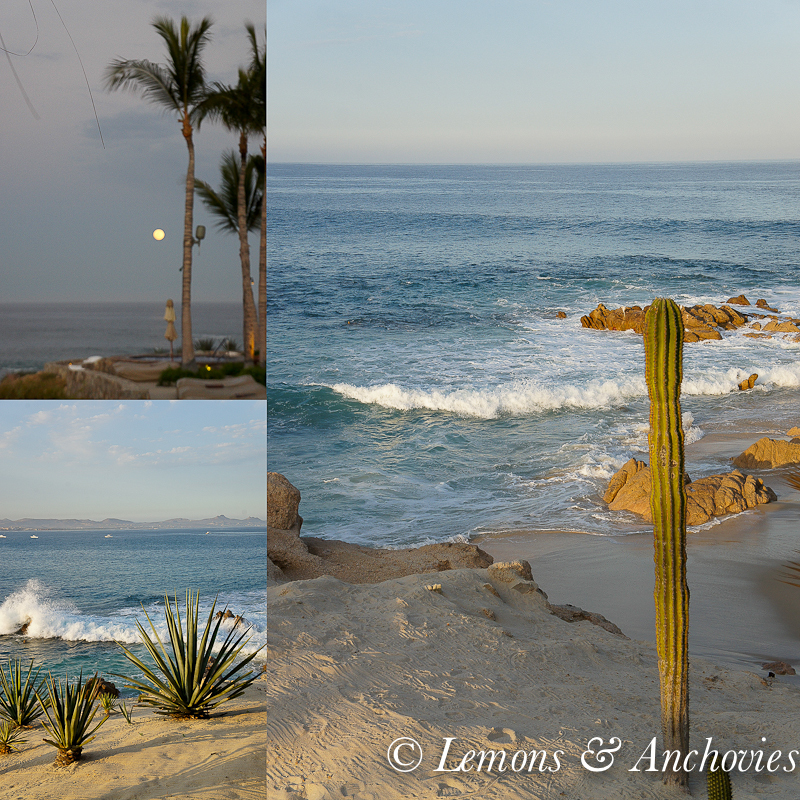 This time we stayed on the same side of the coast and flew down to the tip of Baja California Sur, specifically, to Los Cabos. I wasn’t sure what to expect–there was not much time to do research; all I knew was that it would be a beach vacation. Really, that was enough for me. It would be a six-day getaway, the first two spent on our own before meeting with our friends. The focus of our stay would be in San Jose del Cabo, the quieter, more quaint sister city to the more popular Cabo San Lucas. Setting eyes on cacti scattered along both sides of the road amidst rolling hills as the taxi driver drove us to our hotel was like a promise of a great week ahead. The desert landscape, for me, is second only to ocean vistas so I was excited to see both on this trip. And though we only had a few days and stayed in just one area we still managed to collect quite a few memories. Like every beach vacation I take, a morning walk along the water is a must. Without the heat of the noonday sun and with most people still sleeping off the previous night’s activities, it’s a pleasant way to start the day sharing the beach with only a few other souls. 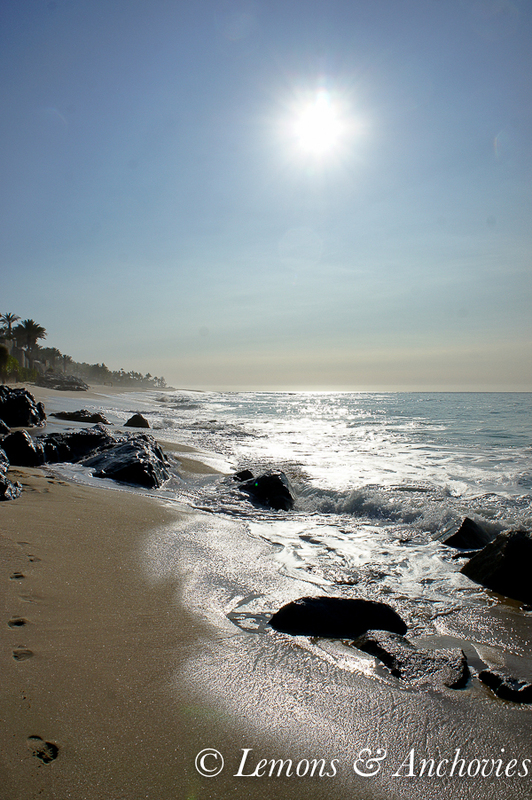 I like the feel of the sand between my toes, the waves approaching and retreating as I walk by. Most of the time my eyes are on the water looking, no, hoping, that I’ll spot a creature or two. When I see a dark shadow on the water’s surface or when I see a small ripple I get excited thinking that I might have spotted a fish. Most of the time, though, it’s just my imagination at work. Still, there was no shortage of sightings on this short trip. On our first afternoon we saw puffer fish washed ashore. I’ve never seen that before. We thought it was a fluke but the morning walks proved this to be a common occurrence in these parts. 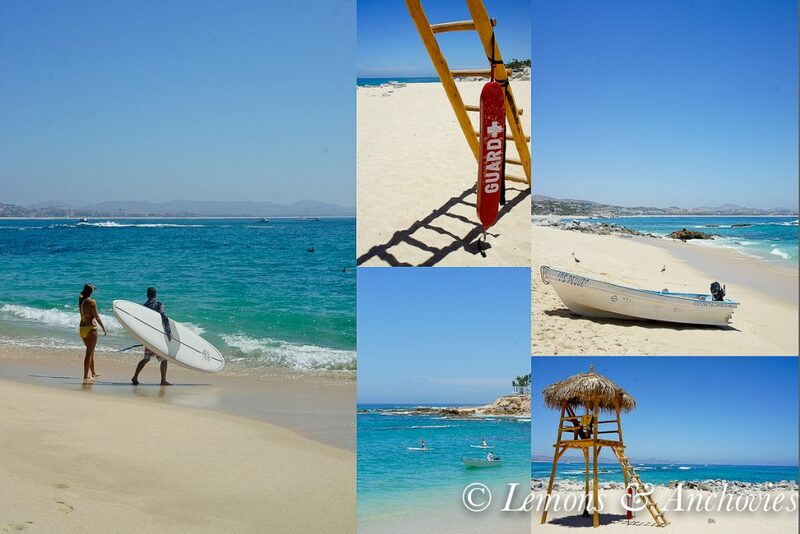 The waters aren’t always calm on this part of the coast–I read that there are only three true swimmable beaches in the Los Cabos corridor–I guess the tiny creatures are no match for the waves. During our first morning walk I spotted my third beached puffer fish. Unlike the previous two, this one was still alive. I wanted to rescue it but with the waves crashing so close to shore and with its pointy spines I couldn’t exactly hold on to it with my bare hands to facilitate a little rescue effort. Oh, and there’s the tiny issue with it being extremely toxic. I walked away just a little sad. Making up for this experience were the pods of dolphins we saw during dinner that same evening. Then on the following morning’s walk, the best thing happened. I was watching the waves crashing on the beach with my husband a few steps ahead of me. I always have my camera and phone at the ready for a good shot. On this morning, I saw dark shadows in the water as the latter retreated from shore. I was ready to dismiss it as nothing since I’m wrong more often than I am right about seeing creatures. But instead of keeping it to myself, I mentioned it to my husband. Before long, there was not only one shadow but quite a few! At about the same time, the wave started to build again. Then it came and through it we spotted about a dozen creatures riding it. What kind of fish were they? 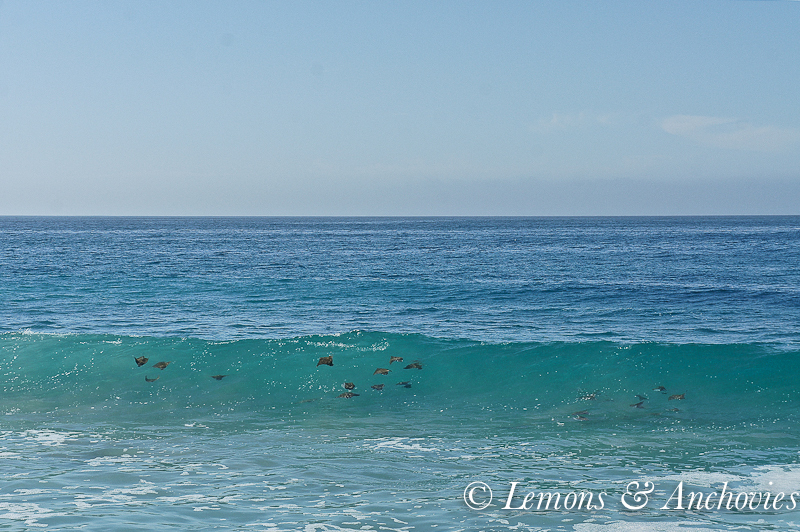 We stopped to watch the next wave and then my husband knew: we were watching rays! They were smaller than a manta ray; in fact, we thought they might be babies (a Google search reveals that they might by mobula rays). It was the most amazing sight to see, these rays flying into wave after wave. With each one that came more rays joined the fun. We watched for about half an hour, captivated by their graceful dance in the water, feeling utterly lucky to witness this performance. We were their only audience. The entire time I clicked away on my camera hoping to capture at least one good shot and I was so happy to get a few. I still get excited thinking about it two weeks later. On our third day we connected with our friends and moved to the Palmilla community within San Jose del Cabo. 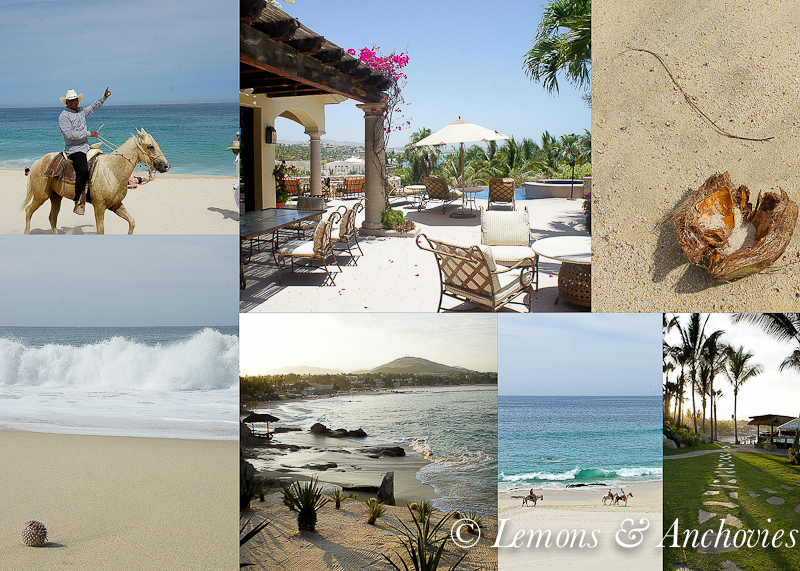 Comprising of the One & Only resort and spacious luxury villas, Palmilla made our already-fun vacation even better. The community is situated in front of one of the three swimmable beaches in the area with boats for fishing expeditions just steps away. As guests, my husband and I were given the entire top level of the beautiful villa for the rest of our stay–a suite with a view of the Pacific Ocean, balcony and all–while our friends stayed in the equally luxurious main living space downstairs. It was heaven, I tell you. 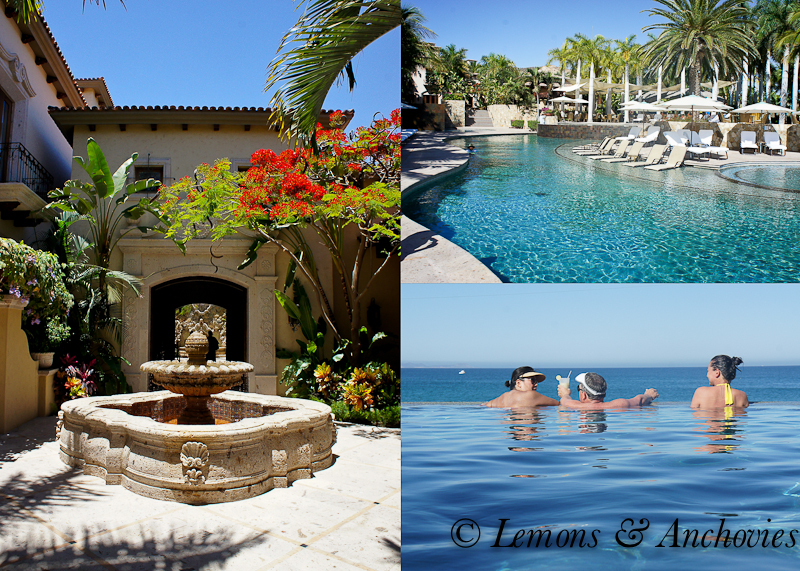 With nothing but relaxation on the agenda we walked on the beach in the morning, lounged all the day by the disappearing edge pool at the private Palmilla club and drank wine at night. Maybe one or two frozen margaritas were delivered to our lounge chairs during the day, too. My husband and our friend hired a boat for an afternoon of fishing and returned with three prizes. Though they were not as big as another tourist’s marlin earlier in the day, his afternoon was time well spent in great company. 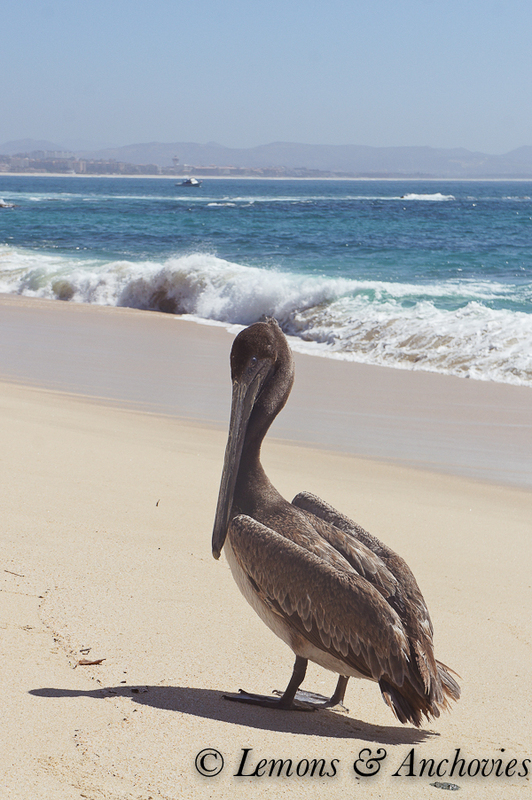 There were two resident pelicans on the beach at Palmilla. The fishing boats being their meal ticket, they know that each one returning to shore means food. 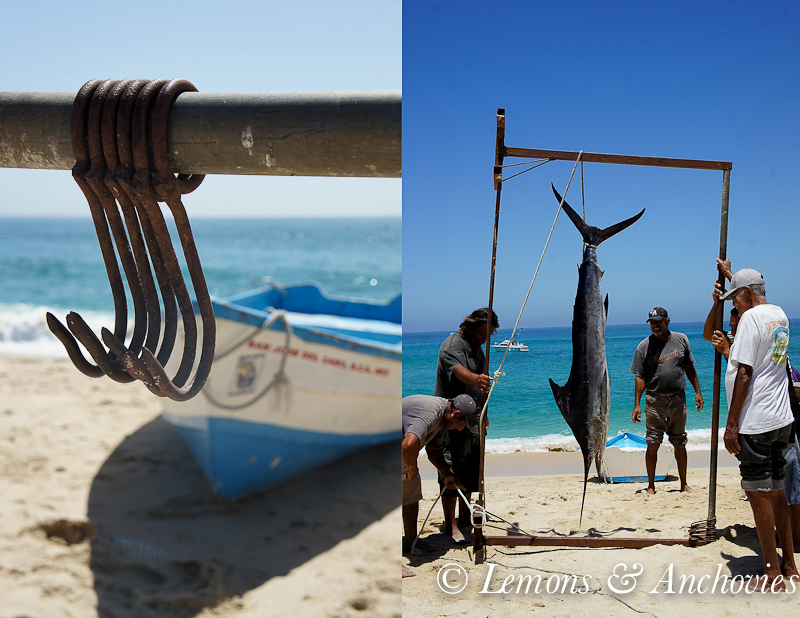 The fishermen would fillet the day’s catch on a table set up on the beach and any remains were given to them. I never expected to ever get so close to a pelican but these two guys were used to being around people. Though still a little wary, they let me get close enough to them to take several pictures. With one eye towards the ocean anticipating the day’s lunch, the other was on me making sure I wouldn’t encroach too much on their personal space. The rest of our time was spent much the same way. We walked as far as we could on the beach most mornings. 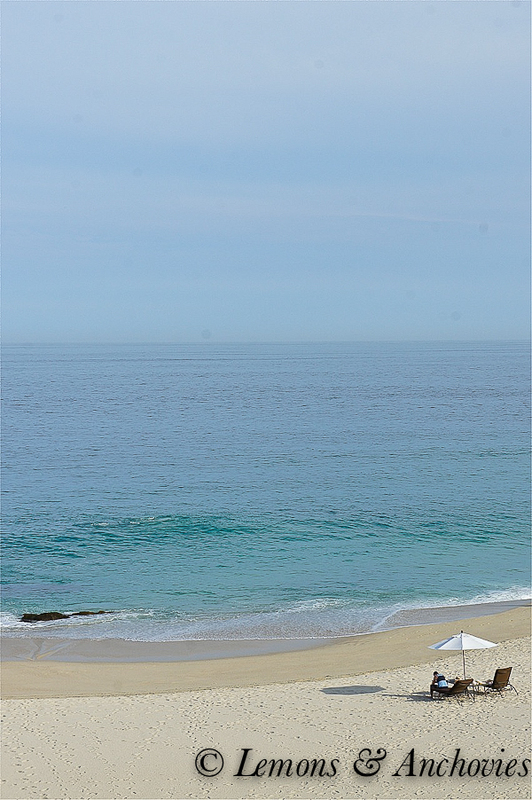 On our last day we ventured toward a more secluded stretch of beach on Palmilla. A local real estate agent who gave us a home tour one afternoon indicated that there are only a few swimmable days each year in this section. We walked for at least an hour after parking our golf carts where the road ends and the sand begins, managing our traverse between the rush of waves on our left and the rocks to our right. Each crossing like this had me with my arms up trying to protect my phone and my camera from being drenched by the salt water. A minor inconvenience to carry them around but I was very happy I did. 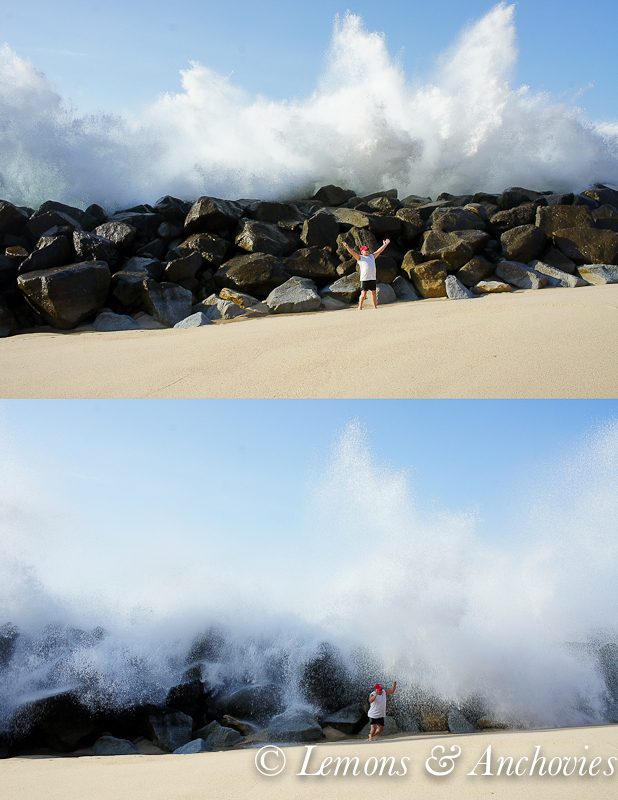 When we came upon a rock wall on the beach our friend stood in front of it thinking he’d get sprayed (just a little). But the thunderous warning as the wave approached was unmistakable. I was so happy to have had the camera ready to capture the major assault that he didn’t see coming. The shots might just be worthy of our friends’ Christmas cards this year–priceless! I would be remiss if I didn’t mention all the food we enjoyed on this trip. As I mentioned on my previous posts, I had some of the best tortillas, salsas and guacamole I’ve ever tasted–and I live in California where Mexican food is taken seriously. But my experience wasn’t at all limited to paper-thin flour tortillas or melt-in-your-mouth tender grilled rabbit from Mi Casa, a restaurant in town. Early in our stay our server recommended a Mexican Chardonnay from Casa Madero. My husband said we’d order a bottle and take any left over back to our hotel room. Well, that bottle never made it past the hotel restaurant–so dry, crisp and refreshing we drank it like water! Perhaps the best dining experience we had was during our last night. We enjoyed cocktails at sunset at Agua, One & Only Resort’s restaurant. With most tables set outside facing the ocean and with an excellent, unobtrusive live band serenading you as you eat we couldn’t find fault with anything, especially the food (for me, that’s saying a lot). Truth be told, part of me felt that Agua would be just hype and even considered suggesting that my friends and I return to Mi Casa in town but I’m glad I didn’t. From the bread to the dips to the entrees and dessert, each plate served to us was an example of excellence. My snapper was seared perfectly but the best part for me was my plate of foie gras with figs. I haven’t had a taste of foie gras since the ban became effective in California last year and my, were my taste buds happy. I would have been happy to eat just that but who could resist sampling more of the menu? If asked to sum up the food I enjoyed in Mexico in one word I would say fresh. 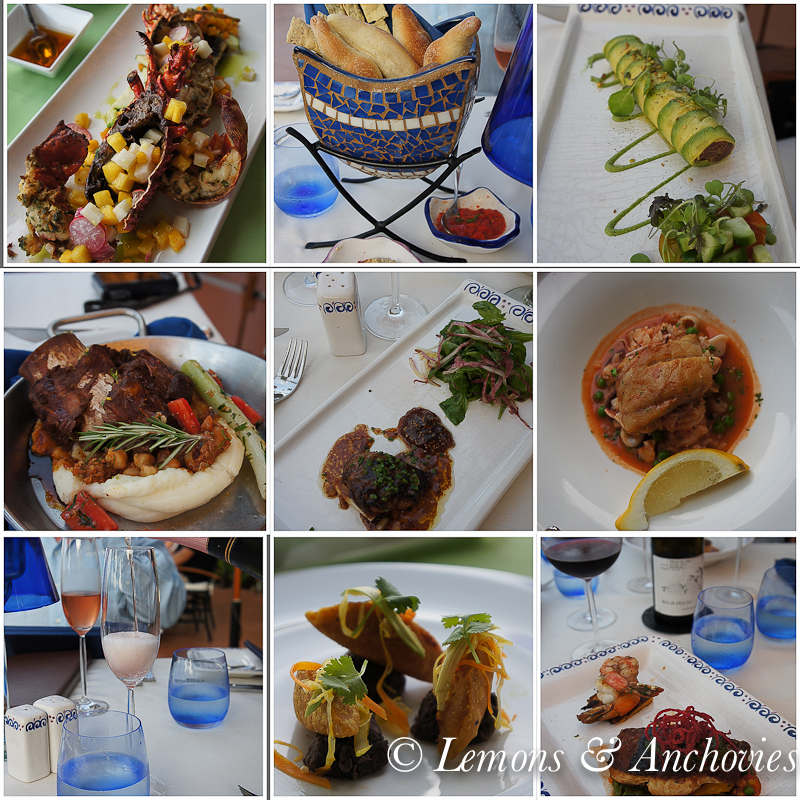 So when it was time to consider what dish I would share as part of this post on Los Cabos, Mexico the decision wasn’t hard to make. I wanted to share something fresh. The lobster I ordered on our first night had cubes of mangoes adding a lively note to the grilled lobster. Immediately, a mango salad came to mind and by the time we connected with our friends and had access to a kitchen, we made a salsa combining all the fresh flavors of Mexico that I had tasted. This is a salad version of that salsa. 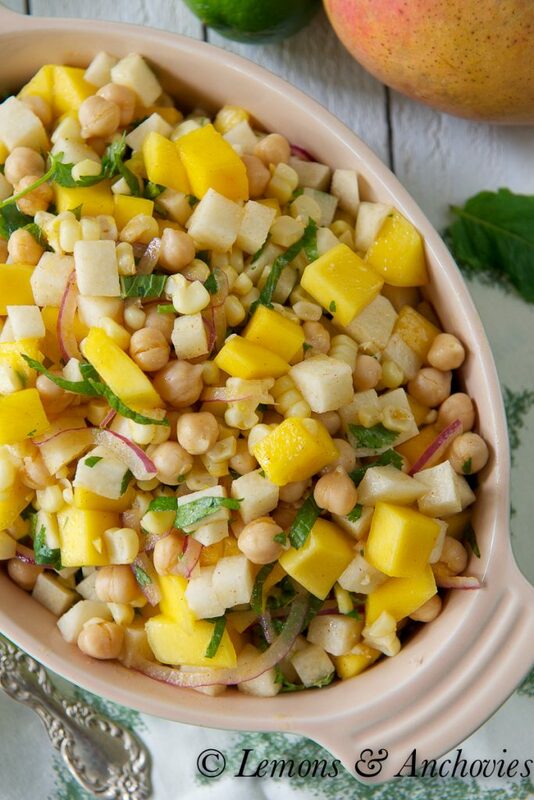 Mangoes, jicama and corn are the main stars here, all brought together by a lime vinaigrette. 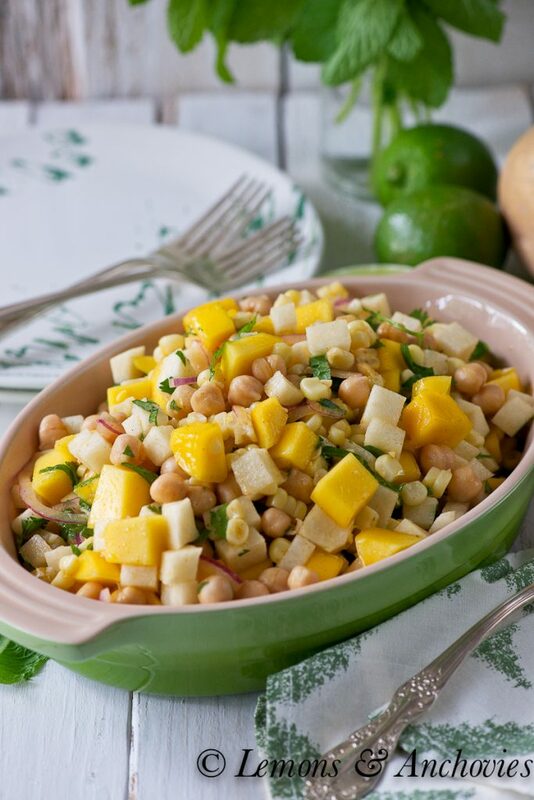 The mango and corn add a touch of sweetness while the jicama provides a wonderful crisp texture. I added garbanzo beans as an afterthought because I really like them but I realized that this salad doesn’t need them at all. What I like is that this mixture is versatile. It is refreshing and light on its own but it also added pop when I topped homemade fish tacos with it. Next time I’ll dice the fruit in smaller cubes to make a salsa and add jalapeños, tomatoes and tomatillos. I think you can’t really go wrong as long as you have fresh ingredients like this. The recipe below is enough for several people (much more than pictured here). It was good for several meals for my two-person household and each bite I took was a fresh reminder of our wonderful, impromptu trip to Los Cabos, Mexico. 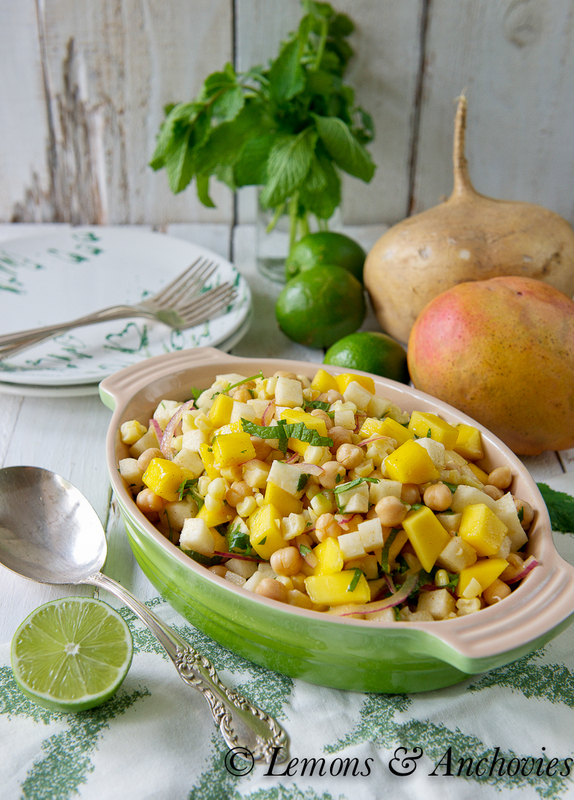 Fresh tropical flavors reign supreme in this easy, summery salad. Dice the fruit smaller and add tomatoes, tomatillos and jalapeño to turn it into a salsa. Prepare the vinaigrette why whisking all the ingredients together, tasting for salt as you go along. Set aside. Combine all the other ingredients in a large serving bowl and toss with the vinaigrette. Better if served chilled. 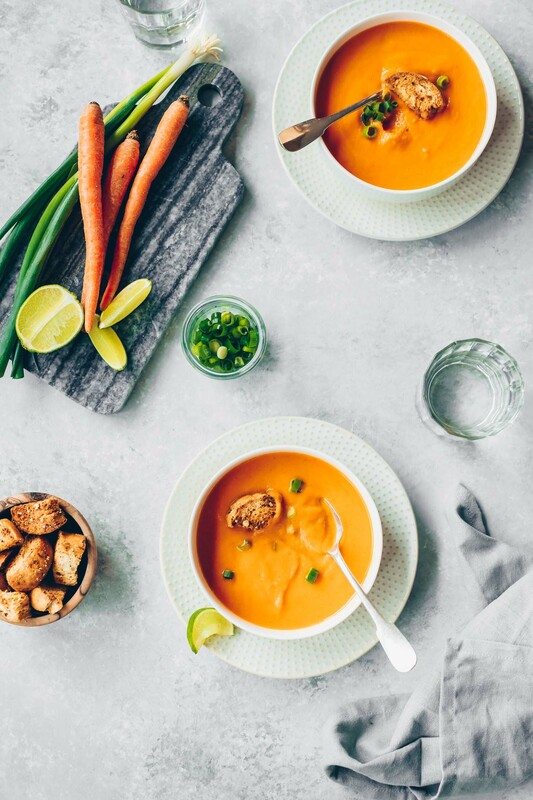 If serving later, wait until just before you serve before tossing the mint and cilantro. 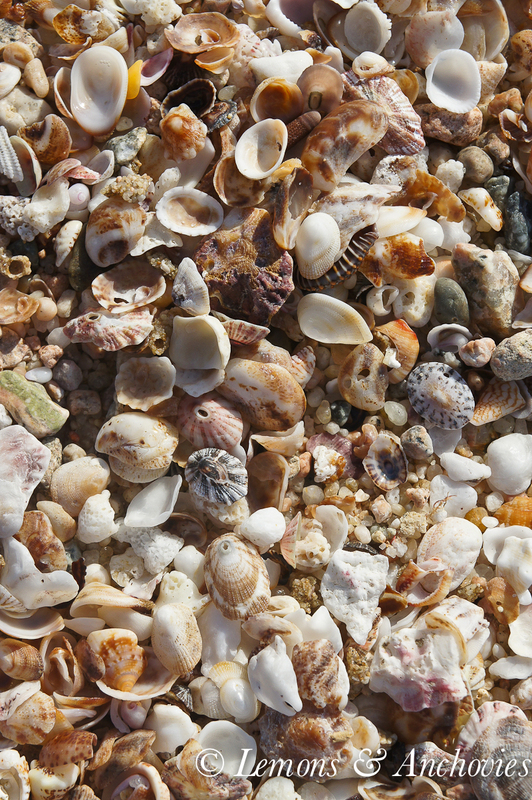 Beautiful photos, what a perfect spot for morning beach walks! There’s nothing more relaxing :). I’m loving this salad, jicama is one of my latest favorite salad toppings! 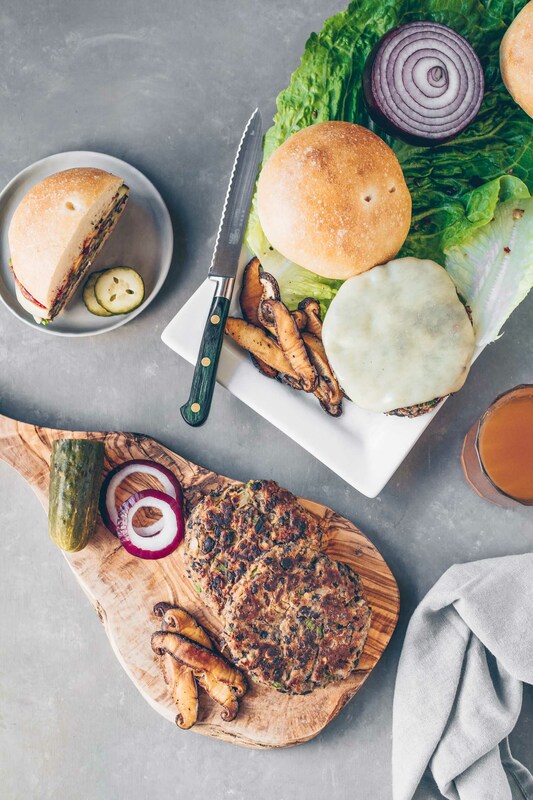 What a wonderfully written travel post and a great recipe to match it. We never make it to those parts of the world as we always head east. I contemplated often making a quick trip but then I start researching, get lost and eventually give up. Beautiful snapshots and memories you collected and thank you for sharing them with us. A delightfully summery salad! Los Cabos is really a beautiful place. Just love your photos. And the recipes are always a treat! Thanks so much! How could you leave? What an incredible place, looks like heaven on earth! This exotic salad looks fabulous too! Jean your trip looks like it was beautiful and relaxing. Your photos are always stunning and I think you could seriously be a photographer for a travel magazine :). Your salad sounds healthy and full of interesting textures and flavor. What an amazing trip! You must feel totally rejuvenated from all of the beauty you saw. Gorgeous pictures. 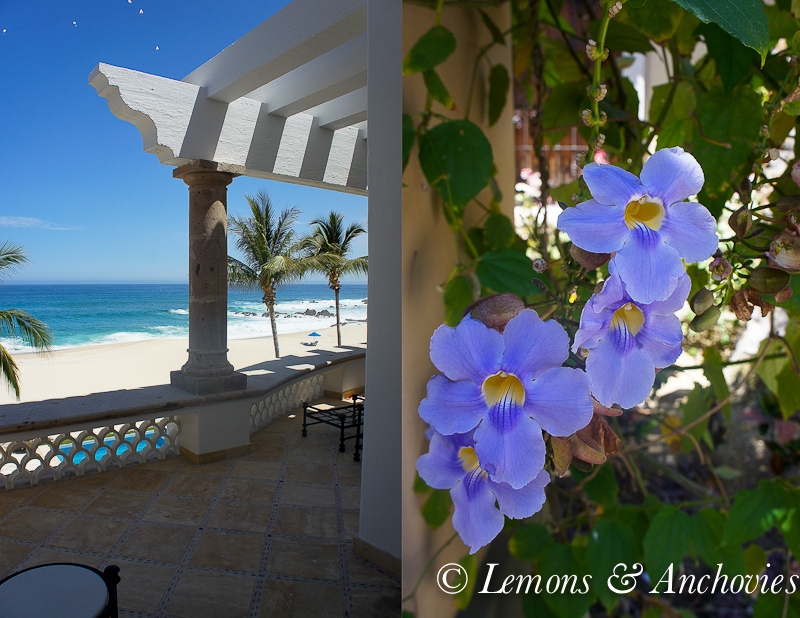 It might be enough to convince my husband that we should escape to Los Cabos WITHOUT the kids! What great memories and food you had on your trip! I love the picture of your friend about to get hit by a wall of water. This salad looks so refreshing and perfect for summer, great flavors! What a great trip – love all the photos and your salad version of the salsa you so enjoyed! Ahhh beautiful pictures! It’s always nice to see other parts of world through someone’s travel photos. More personal (especially with writing) and it’s more fun! This is a lovely refreshing salad for a summer get together!